It’s very interesting to note that the cover to this novel doesn’t include a title. Or the author’s name. Or anything but a large photograph of Henry Winkler as Arthur “Fonzie” Fonzarelli. How well it sold based solely on Fonzie’s mug is anybody’s guess. 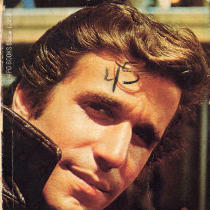 My copy has a large 45 written in what appears to be crayon on Fonzie’s forehead. And some other marks. It’s a worn book but certainly readable. Unfortunately, the story itself wasn’t. Like Happy Days #1 – Ready to Go Steady (which I reviewed in June), Fonzie, Fonzie Superstar is quite juvenile. It really doesn’t capture the tone of Happy Days at all. For example, while Fonzie was never depicted as being book smart on the show, he certainly wasn’t a moron. Many of his lines in Fonzie, Fonzie Superstar, while probably intended to be amusing, paint him in a very, very stupid light. Still, there were a few occasions, I could almost hear Tom Bosley delivering some of Howard Cunningham’s lines. In fact, it was one of these lines that gave the book its only laugh out loud moment. To set the scene, let me explain that Fonzie, Fonzie Superstar begins with Fonzie learning that he can win $100 at an amateur talent contest over a radio program called Dr. Fortune’s Amateur Hour. Everybody wants to try their hand at a so-called talent and Howard laments that in his youth he had ambitions and dreams of being an actor, not a hardware salesman. I laughed, anyway. The big mystery as the book starts is what Fonzie’s talent will be. Richie is certain he can’t win but Fonzie insists he will. And he does win the regional audition with the beautiful music he makes on hubcabs hanging from a wooden frame. Before long a man named Phil Phillips arrives at the Cunningham home promising to make Fonzie a superstar. Fonzie has that unknown quality that makes one a star. Howard doesn’t have it. Joanie doesn’t have it. But Fonzie does. There’s also the matter of Clara Bow, an opera singer who shatters glass with her high pitched voice. She eventually falls for Fonzie, who would rather be working at his garage than worrying about contracts or anything. By the time the novel ends, Phil Phillips has convinced Fonzie to provide the soundtrack to a screen test featuring Howard’s version of Romeo and Juliet, with Marion as Juliet. It’s filmed in front of an auditorium full of screaming, fainting girls. Everything falls apart at the end (literally, in some cases) and Phil Phillips is revealed to be an escaped mental patient who spent an astounding amount of time on the phone talking to the weather announcement. Fonzie gets his $100, Howard decides he’s happy being a hardware salesman and Clara discovers the wonder of the Hula Hoop. There are six other Happy Days tie-ins I haven’t read, all written by William Johnston, and I can only hope at least one of the others is actually worth reading. One is a novelization, so it probably accurately reflects the show. William Johnston was the most prolific writer of “TV tie-in” paperback novels during the ’60s and ’70s, and usually got the characters and situations down pat in his original stories. However, there were times when he was under a deadline, or didn’t have that much “leeway” inbetween the various TV series he adapted in book form…and this looked like one of those where he didn’t quite “get it right”.